A 21-year-old female with a history of right-sided thalamostriate arteriovenous malformation (AVM) between the right anterior cerebral artery and right ophthalmic artery presented with decreased vision in the right eye. Best-corrected visual acuity (BCVA) was 6/18, N12 in the right eye and 6/6, N6 in the left eye. Fundus revealed a retinal racemose haemangioma (RRH) with a retinal artery macroaneurysm (RAM) [Figure 1]a. The left eye was within normal limits. 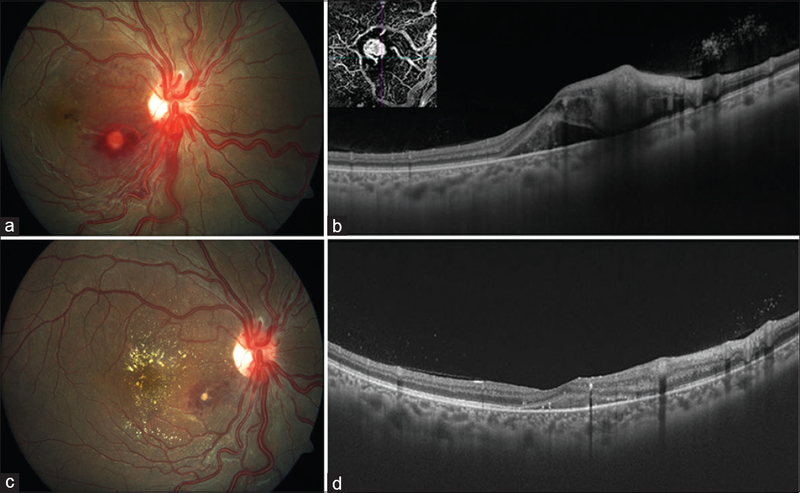 A swept-source optical coherence tomography angiography (SSOCT-A) demonstrated marked retinal thickening and subretinal fluid (SRF) on B-scan [Figure 1]b with angiographic image demonstrating the high blood flow RAM lesion in superficial retina [[Figure 1]b, inset]. A diagnosis of Wyburn-Mason syndrome with a leaking RAM was made. Intravitreal ranibizumab (0.5 mg in 0.1 ml) injection was administered. At 1-month follow-up, the thickening and SRF had resolved [Figure 1]c and [Figure 1]d. The arteriolar and venular turgidity too had decreased. At the last follow-up, at a period of 4 months post-injection, there was no recurrence and BCVA in the right eye was maintained at 6/9, N6. To the best of our knowledge, this is the first report of RAM exudation in a known case of Wyburn-Mason syndrome which was successfully managed with intravitreal ranibizumab.